Oh man, you guys. This. Is. Big. It's been so hard not to spill the beans before now and, I have to say, this is probably one of the most exciting opportunities I've ever been able to share here! You see, I've been a huge fan of Sam Edelman since I bought the black Gigi sandals (most recently seen here and here) three summers ago. I live in them. They go with everything. There's no sandal I've ever loved more. Period. And if you've been to Target lately (I'll assume you go at least once a week like I do), you've probably noticed the exclusive Sam & Libby for Target collection he and his wife created. Each shoe has the quintessential Sam Edelman staples - especially the Kamila (pictured above), which is just like my beloved Gigis. 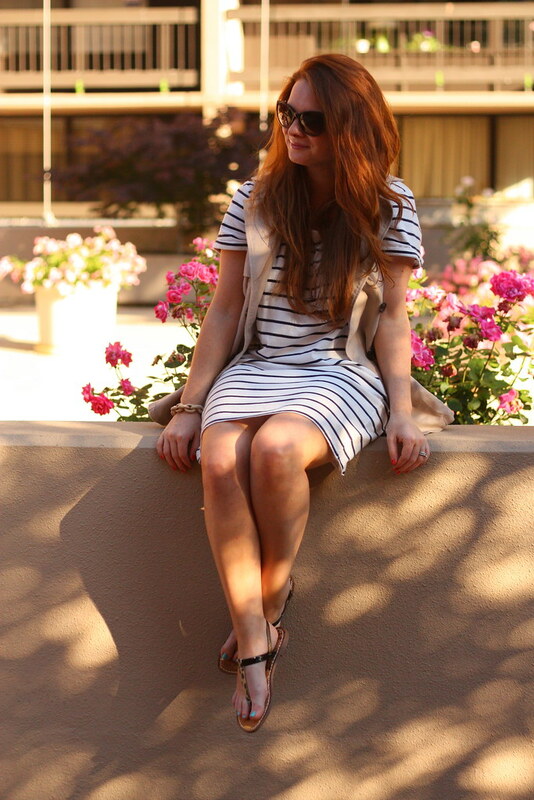 So today, I'm helping Target celebrate this summertime collaboration with a giveaway! But not just any giveaway. No sir! 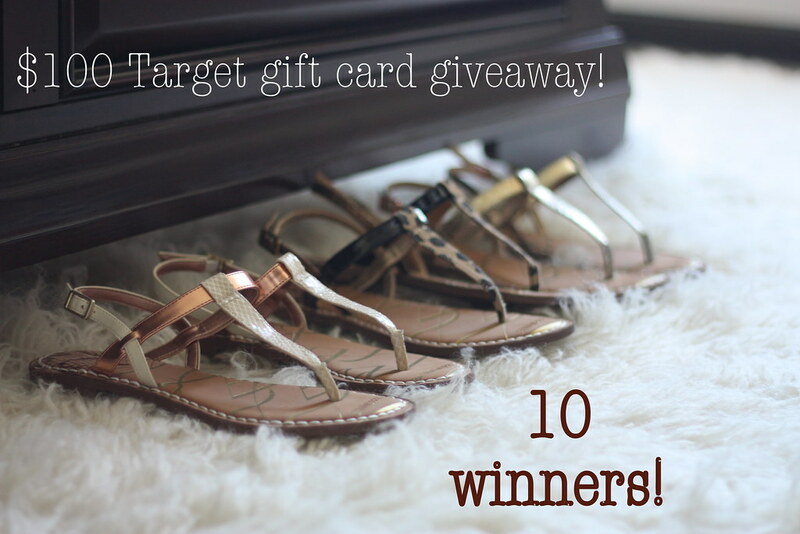 Today I'm giving away ten -- you heard me right, TEN -- Target gift cards worth $100 each!! 1-0. Squeeeeeeeeal! You and I both know how far $100 can go at Target, and I'm so jealous that ten of you lucky devils will be partaking in a little shopping spree in the very near future! I wish I could enter myself...but that wouldn't exactly be fair, now would it. #Bummer. 1. Leave a comment below...and please include your e-mail address! This is very important because it'll allow me to get in touch with you if you win. If I can't contact you, I'll have to pick another winner! Sad face. 2. Like Chain Strap Purse on Facebook OR follow me on Twitter. You only have to choose one! 3. Depending on which you do, either share this post's link on Facebook OR tweet it and make sure to mention me! One entry per person and all requirements must be met. The giveaway is open to U.S. residents only and ends next Tuesday, June 11 at 11:59 p.m. Winners will be chosen at random. Target is every woman's kryptonite! Amazing give away! Ahhhh! I need this in my life! I love Target and stock up every year on new summer staples. I haven't been able to indulge yet this year and winning this gift card would be the perfect excuse... Not to mention would keep me from getting in trouble with the hubby ;) great blog too, affordable, achieveable style for all! I follow you on Twitter and tweeted the link! Best. Giveaway. Ever. I heart Target! I actually have a growing shopping cart on Target.com as we speak... What perfect timing! And I've been a Facebook follower since last year! How exciting; thank you for the opportunity! I LOVE the Panama Hat with cutoffs! I might have to take advantage of the J. Crew sale and finally get one for myself. Amazing giveaway, I tweeted the link (@amandajleech)! Great giveaway! I follow on Twitter. Yup definitely go at least once a week and they have some ADORABLE wedges in the collection right now!! Cislin89@gmail.com --have been following you so I'll definitely share this giveaway! & Target is probably the most dangerous store ever when it comes to trying not to buy EVERYTHING in the entire store! OMG I am addicted to target once and sometime 2x a week, love this store and lets not mention your blog! UM. Yes. I could spend $100 at Target in about 5 minutes flat, great giveaway lady! YES. pick me pretty please? I could buy so many shoes with that giftcard! Esp the ones I featured on my blog yesterday (http://www.99boxesofshoes.com/2013/06/target-does-it-again.html) perfect timing with this giveaway! AHHH! What a fantastic giveaway!! Target is AMAZING!! I followed on facebook and shared the post about the giveaway! Follow you on Twitter and tweeted about it! Ummm, what a FABULOUS giveaway. I think I'm in Target 2x weekly so sign me up! I've followed you on Twitter & tweeted it!!! And might I add how adorably summer ready you look.. I wanted desperately for that J Crew hat to look half as cute on my head as it does on you, it looks like it was made for you! I am so excited that I found your site today! Thank you for your posts! They are inspiring! I just bought that dress! I love your style and your toe nails! I could do some damage with that $100! Thanks for the giveaway :) Following on twitter @stylediaryblog. Done all! I would love to win this! Thanks for the chance! Yay for fantastic giveaways!! That's a great one. I follow you on Facebook as Mary Happymommy and I shared on Facebook. Just tweeted about this amazing giveaway!! Thank you for hosting this!! Fabulous giveaway! You Rock, Alison!!! Target and I have such a love/hate relationships. Basically because I go in thinking "oh I only need milk" and come out with a cart load of stuff. AMAZING!! This might be the best giveaway in the history of giveaways. I liked on Fbook. Wow, this is amazing!! Those shoes are adorable. How exciting!!! This is a great giveaway. I have yet to check out the Sam & Libby for Target collection... shame on me! Anyways, I already follow you on Twitter and like you on Facebook. Also, I will tweet about the giveaway! I love Target. Thank you for the great giveaway! Such a generous giveaway! Starting the summer with excitement! I'm following you on FB. You're so right- a $100 can really go a long way! Thanks for this exciting giveaway! What a great giveaway! My fingers are crossed! We love Target and can always find great deals there! Great giveaway! Followed you on Twitter and tweeted this post. HOLY. CRAAAAAAAP. You said a huge giveaway and I had NO clue just how amazing it would be. I'm drooling just thinking about a $100 gift card. Fingers crossed! Perfect to pick up some shirts at Target. Ooh, Target, the magic land of my dreams! Especially when I get to shop by myself without the kids. It's like a mini-vacation! Cute pictures, by the way!!! Awesome! I love those sandals; I would get a pair too! UM this is AMAZING! I love all the Sam & Libby styles so I pretty much LOVE this post! I'm already following you on twitter and just tweeted about it! Fingers crossed!! Eeee!! Love everything about Target! And love everything about this blog!! Target is my favorite store. Thanks! I love Target and spend way too much money there! Holy shopping, this is wonderful! As if I'm not at Target enough already. I love shopping at Target. Thanks for the chance! I like Chain Strap Purse on facebook. I adore Target so much!!! Its my most favorite store in the world yessssss im addicted to all the clothes womens,men & children my kids always get their clothes from target so do I but i always get my sandals makeup, jewelry and food ;-) i just love my target!!! Griceldasanchez47@gmail.com!!!!! i had to use my daughters fb mayaalgarin. ** God please I may be the one! Amazing giveaway! i follow you on twitter and tweeted the link to this post! Amazing giveaway I Love it..Love target but i cant afford anything. Email is in blogger profile link! This would be AWESOME!! Thank you so much for the chance to win - I would love this to stash away for Christmas purchases!! Target is my LIFE! Thanks for the chance! Cool giveaway. Already liked you on facebook! Great giveaway. Followed on twitter and shared on facebook. Wow..I hope I am one of the 10 winners. Thank you for the awesome giveaway! I love Target, such amazing deals... thanks for the chance to win this is one amazing giveaway! Target is one of my favorite places! Oh Target is my favorite too! I love shopping there...such great prices and LOVE all their great sales! Target is my favorite! La la LOVE that store! Thanks so much for the BEST giveaway ever! I follow you on Twitter (@kaizenfashion) and tweet! This is so great! I've had my eye on some stuff over there!! Eeeeeek! This is like a dream! I've had my eye on the Sam & Libby's but haven't taken the plunge! Want every pair! Consider yourself followed on twitter! So excited! Love Target!! What an amazing giveaway! Thank you for the chance! Following you on twitter @jillyrh #1500 follower! Woot! What an amazing giveaway! I liked under MC Chau and followed on Twitter under @cxc118. I tweeted here: https://twitter.com/cxc118/status/343862043775991809 Thank you so much! Love Target and love Sam Edelman! What an awesome giveaway! $100. at Target is incredible give away!!! LOVE the sandals... need them for my summer wardrobe. A bit retro with an update! This giveaway is incredible !!! I deleted my Facebook a while ago and made a twitter for this giveaway lol :) Thanks for the giveaway and I LOVE your blog!! Love this giveaway, I want to buy everything! LOVE target, thank u so much!!! Wow! I could really use the gift card, I need some summer clothes and a nice pair of sandals. Thank you for this opportunity and Best Wishes to all those who entered! 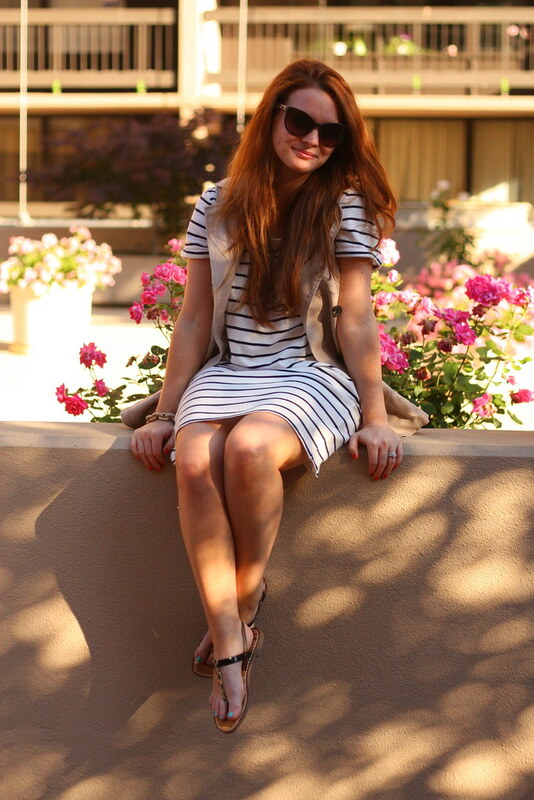 Keep killin' it on the blog, girl! Amazing giveaway!!! I could totally use this for summer gear!